Free tickets, why not. I'd say I'm a Smith's fan, but just about as minimally as possible - I like a couple songs. I can't even tell you what albums they're on, or how many they have - let alone how many solo albums Morrissey has. Still, why not. If anything, it’s worth seeing the level of dedication this man commands. Overall, I liked the show. 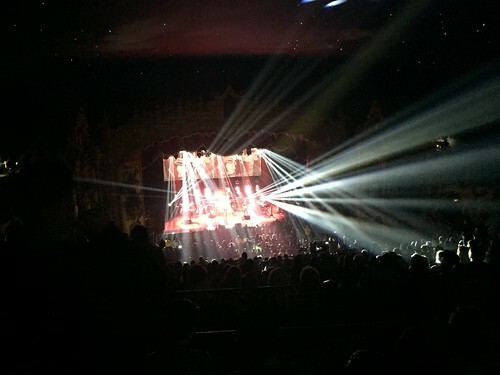 It has me wishing I knew these songs better… It was a big band and a big light show, which I wasn’t expecting. His voice and the energy is pretty great. If I hadn't known to look for cantankerous behaviour, I wouldn't have known otherwise. "The 90-minute concert opened with an cappella rendition of the Pretenders’ ‘Talk of the Town’ before Morrissey, who admitted later in the show that he was rather pleased to be playing in the town that Pretenders singer Chrissie Hynde once called home, and his bandmates took a quick bow to one another and launched into ‘Suedehead,’ an early solo song that could pass as a Smiths tune since it retains the self-questioning lyrics and falsetto lyrics that distinguish Smiths songs. Throughout the set, the band alternated between dark and moody sonic textures (a particularly gritty guitar solo distinguished ‘Istanbul,’ which was made all more dramatic with some dark red lights) and folk-inflected pop (‘Staircase at the University,’ which concluded with an acoustic guitar solo). 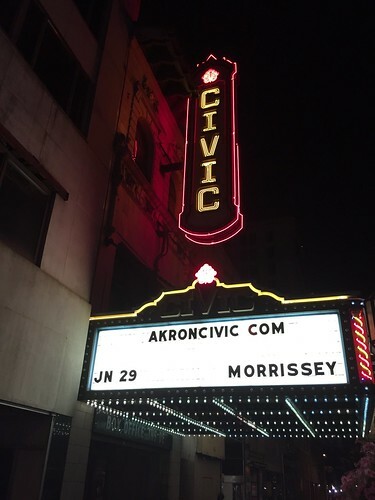 Morrissey’s voice sounded terrific and his backing band capably kept up with the mood shifts and delivered a spot-on rendition of the careening Smiths tune ‘Stop Me if You Think You’ve Heard This One Before.’"